This pillow and mat were inspired by the ancient Indian theory of acupressure. The peculiar-looking pillow and mat were inspired by the ancient Indian theory of acupressure. According to the theory, the body is lined with "pressure points" which, when stimulated, release natural pain-relieving hormones.The plastic points scattered across these pillows prickle the skin, eventually releasing endorphins similar to those we experience after an intense exercise session. The bodyʼs very own "happiness drug," endorphins provide a sense of joy and a jolt of energy. To activate these feel-good hormones, just lie on the bed for a minimum of 10 minutes. While it may feel uncomfortable at first, after a few minutes the pressure will give way and you'll be able to enjoy the technique's healing benefits. Made in China. I have one friend who already raves about this product, so I gave it to another friend who similarly has struggle with back pain. She says it is fantastic. She sleeps in it for the first few hours every night and is ordering the neck pillow too! Super. Made a huge impression! Good for relaxation and stretching of the neck. Also can be used for lumbar support in the car, sitting on couch or laying flat on back. It's very unique the first time you lay on it. You think it's going to hurt you, but it does not! It feels very interesting and you can feel a release of pressure from your body. Looking at the product, you would think that something called 'Bed of Nails' would be painful! In fact, it is not. When you first lay on it, yes, it does feel odd, but once accustomed, it feels great. You can feel it working. 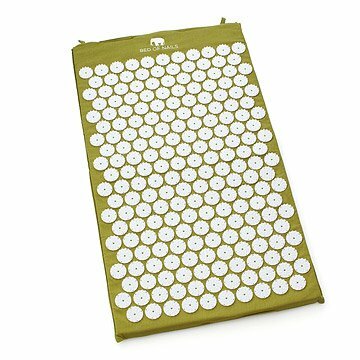 My father in law loves this mat and said that the acupressure points are not painful to lay down on at all. He said laying in the mat feels really good, which I believe because he doesn't look like he wants to get up whenever he lays on it. Works great for all people and body types. Can be used in many ways and for varying lengths of time. Great on the feet and back as well as frontal positions. I recommend it to people of all shapes, sizes and ages. Takes a little getting used to, but you will notice improved muscoloskeletal relaxation the very first time you use it- even if only used for 5 minutes. I use both the mat and pillow daily and find them very relaxing.